Fellow MSTies of “Mystery Science Theater 3000” everywhere will jump for joy for pre-Thanksgiving and post-Thanksgiving treats in honor of the 30th anniversary of MST3K! Shout! Factory/Shout! Factory TV, in association with Twitch will present the “Mystery Science Theater 3000 Turkey Day” (pre-Thanksgiving) marathon. The upcoming “Turkey Day” marathon will begin early this year on Sun., Nov. 18 at Noon Eastern/11 a.m. Central/10 a.m. Mountain/9 a.m. Pacific (according to the official MST3K/Shout! Factory/Shout! Factory TV social media feeds). The marathon will be airing on Shout! Factory TV’s official “MST3K Turkey Day” site (a.k.a. “Shout! Factory TV Live”), Shout’s official live “MST3K Turkey Day” YouTube channel and on Shout’s live Twitch channel. The early “Turkey Day” event of classic MST3K episodes will also be simulcast on Shout’s official live MST3K channel on Pluto TV, which can also be seen on Roku and select streaming devices. “Mystery Science Theater 3000 Live: ‘Watch out for Snakes!’ Tour” is coming to select cities throughout the nation (July 6-Aug. 12)! With the recent return of “Mystery Science Theater 3000” on Netflix, fellow MSTies will be excited about an upcoming nationwide MST3K live movie riffing showcase. An announcement was made recently on the official Mystery Science Theater 3000 site that the first nationwide touring production of MST3K will be brought to 29 major cities throughout the country. The showcase is titled “Mystery Science Theater 3000 Live: ‘Watch out for Snakes!’ Tour” and will run from July 6-Aug. 12 in select cities. As 2016 has been a big year for fellow MSTies, the reboot of the series will be launched on a popular video streaming service. Screengrab of animated GIF (from the official MST3K Twitter site). According to the official MST3K Twitter and Facebook sites (and by word of mouth from one of many “friends of the matinee”), the relaunch of MST3K will occur on Netflix. The announcement was made during an MST3K panel discussion that was held at the San Diego Comic-Con in July, according to Alex Osborn’s IGN article on the return of the series. The new MST3K will be available to stream on Netflix throughout the United States, Canada, the United Kingdom, Ireland, New Zealand and Australia. In addition to Jonah Ray (as Jonah Heston), Felicia Day (as evil overlord Kinga Forrester), Baron Vaughn (as the third voice of robot companion Tom Servo), Hampton Yount (as the third voice of robot companion Crow T. Robot) and veteran comedian/writer Patton Oswalt (as “Son of TV’s Frank), several familiar MST3K cast members will make cameo appearances in the new series. It was announced that Bill Corbett, Mary Jo Pehl and Kevin Murphy will make cameo appearances in the reboot of the series, along with original host and series creator Joel Hodgson (according to an official Netflix press release). 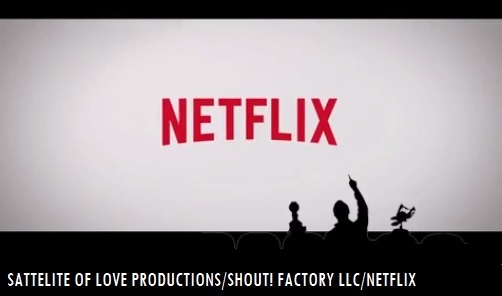 The reboot of “Mystery Science Theater 3000” will be part of Netflix and their stable of original television series offered on the streaming service. SIDEBAR: “Silver Screen Reflections” hopes that the new MST3K will be a success on Netflix, with new riffs of other cheesy low-budget motion pictures. When the new MST3K is released on the paid streaming video platform, it might be a good time to use the free month trial, which is good for one month (for those that haven’t used Netflix before). Questions/Comments? Drop a line at the comments section! Fans of “Mystery Science Theater 3000” and “RiffTrax” flocked to select theaters from coast-to-coast to watch the 20th “RiffTrax Live” cinematic event. 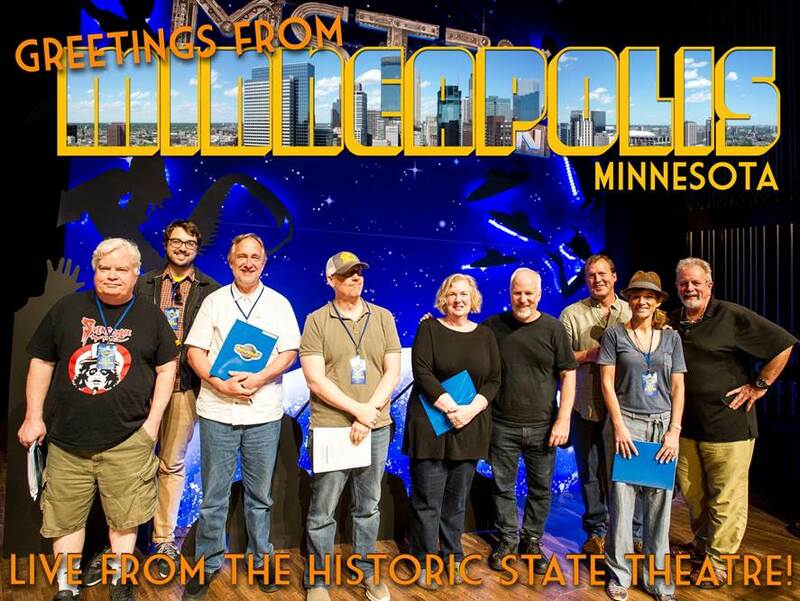 Veteran riffers and MST3K alums Michael J. Nelson, Bill Corbett and Kevin Murphy performed their 20th RiffTrax Live event from the State Theater in Minneapolis, Minnesota on the evening of Tue., June 29. 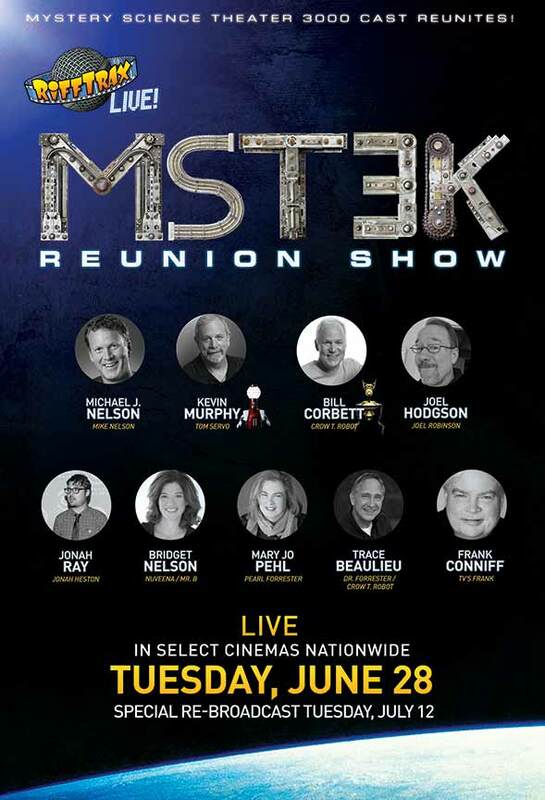 In commemoration of the 10th anniversary of the popular film riffing service and the relaunch of MST3K, the majority of cast members from the original run of MST3K appeared on stage with the RiffTrax crew, including series creator and first host Joel Hodgson, comedy writers and performers Trace Beaulieu, Frank Conniff, Mary Jo Pehl, Bridget Jones Nelson and Jonah Ray, who will be the host of the new MST3K. The event showcased many cheesy educational and industrial short films that were riffed during the presentation, including “The Talking Car” (1968, Alfred Higgins Productions/AAA, riffed by Bill Corbett, Kevin Murphy and Mike Nelson), “A Word to the Wives” (1955, Telamerica, featuring Darren McGavin as the angry father, riffed by Bridget Nelson and Mary Jo Pehl), “More Dates for Kay” (1952, Coronet, riffed by Trace Beaulieu and Frank Conniff) the Caterpillar industrial safety film, “Shake Hands with Danger” (1970, produced by Centron, riffed by the RiffTrax crew) and an AFL-CIO short on Barbers and Beauticians (1950’s, riffed by Joel Hodgson and Jonah Ray). All performers joined together at the conclusion of the event, titled “Super Riff-A-Palooza!” The remaining riffed shorts consisted of a 1954 featurette, “Stamp Day for Superman” (produced for the U.S. Treasury Department by the producers of “The Adventures of Superman” TV series, featuring George Reeves) and a RiffTrax favorite- the 1970 ACI short subject “Grasses,” part of the short-lived educational film firm’s “At Your Fingertips” series. 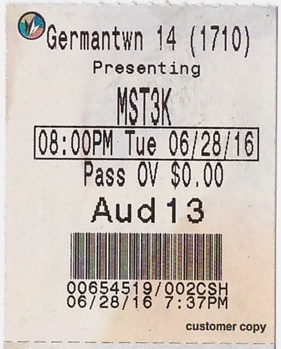 “RiffTrax Live: MST3K Reunion Show” was showcased at Regal’s Germantown 14 cineplex in Germantown, Maryland. Shown inside multiplex auditorium #13,* eager MSTies and fans of RiffTrax were delighted by the presentation from start to finish, along with pre-show trivia slides and a digital goodies package for patrons of the show. Compared to the previous RiffTrax Live presentation of the 1994 Z-budget film, “Time Chasers” (which was shown at the same cinema venue back in May), the auditorium was nearly full for the special event. Prior to the show, an unidentified man commemorated that evening’s presentation by wearing a “Castleton” t-shirt. He regretted not wearing his shirt for the previous “Time Chasers” presentation. Another spectator wore a Tommy Wiseau “Ohai” shirt in commemoration of the event (the RiffTrax crew riffed Wiseau’s 2003 low-budget drama, “The Room”). “RiffTrax Live: MST3K Reunion Show” was enjoyed by fellow MSTies and fans of the RiffTrax crew when it was showcased at Regal’s Germantown cineplex. It was the perfect rib-tickling stressbuster that was enjoyed by all. Here’s to many more years of cinematic riffing. Missed out on “RiffTrax Live: MST3K Reunion Show?” Don’t worry- RiffTrax and Fathom Events will be showing a special re-broadcast (in select cinema venues from coast-to-coast) on July 12 at 7:30 p.m. Eastern. A “Silver Screen Reflections” Shout-Out: The writer of “Silver Screen Reflections” would like to thank the people at RiffTrax and Fathom Events for the press passes to “RiffTrax Live: MST3K Reunion Show. ” It was an enjoyable and fun experience. Thank you letting us be a part of the presentation!